Silicon wafer production capacity last year wasn’t enough to meet supply and demand across several IC segments, particularly memory components and discrete semiconductors, which resulted in component shortages and extended lead times. Wafer capacity is now forecast to increase over the next two years, which will lessen supply constraints and stabilize pricing as more capacity is brought online. 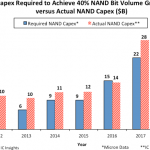 But buyers shouldn’t expect to see any relief from tight supply for either memory components or discrete semiconductors until the second half of 2018. 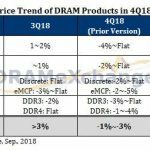 Market research firm TrendForce doesn’t expect new DRAM production capacity to be available until the second half of 2018. 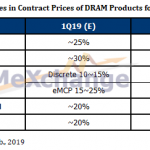 Several memory device manufacturers have announced plans to ramp up production capacity over the next few years, which should stem the steep price hikes experienced over the past 18 months and stabilize pricing by 2019. 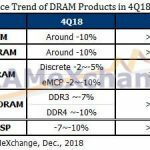 Samsung, SK Hynix, Micron, Intel, Toshiba/WD, and XMC/Yangtze River Storage Technology all have reported plans to ramp up 3D NAND flash production, while Samsung and SK Hynix also are increasing DRAM capacity over the next two years. This memory ramp-up is expected to raise industry wafer production capacity to 8 percent in 2018 and 2019, according to IC Insights’ 2018-2022 Global Wafer Capacity report. This will translate into an annual average growth rate of 6 percent from 2017 to 2022 compared to the industry growth average of 4.8 percent from 2012 to 2017. 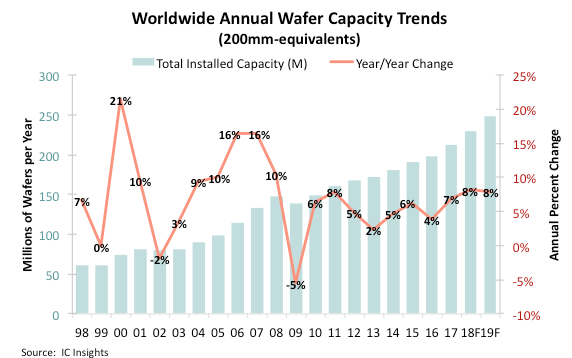 IC Insights believes large swings in wafer capacity are moderating, and IC manufacturers are doing a better job of matching supply with demand. 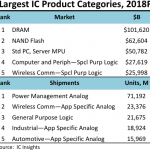 “Many companies, DRAM and NAND flash suppliers in particular, have become much more active with new fab construction and expansion projects at existing fabs,” said an IC Insights analyst. “It’s still an incredibly difficult task for companies to gauge how much capacity will be needed to meet demand from customers, especially given the time it takes a company to move from the decision to build a new fab to that fab being ready for mass production,” according to the market research firm. Several discrete semiconductor manufacturers also have announced production capacity expansions to alleviate some supply constraints, particularly for diodes and MOSFETs. While supply is still tight for many of these products, suppliers expect lead times to normalize in the second half of 2018 as more capacity is brought online. Vishay is in the process of adding production capacity for diodes and MOSFETs which will gradually improve lead times in the second half of 2018, said David Valletta, executive vice president, worldwide sales, Vishay Intertechnology. 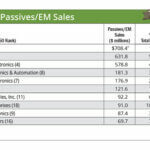 Growing demand for IoT applications, automotive electronics, and smart home devices drove some foundries to shift some of their 200-mm production from LCD driver ICs to more profitable power management IC and microcontrollers, causing prices to rise by five to 10 percent for the driver ICs, according to WitsView, a division of TrendForce. Supply issues at Diodes Inc. also contributed to tight supply last year. A fire at Diodes’ KFAB wafer fab in Lee’s Summit, MO, suspended production in November 2016 through January 2017. Diodes also was notified by the landlord that it would not renew the company’s lease of the KFAB wafer fab facility, which expired in December 2017. At that time, Diodes started to transfer some of the KFAB capacity to its other wafer fab plants. “We are ramping up SFAB 1 to support the KFAB shutdown,” said Keh-Shew Lu, Diodes’ CEO, during the company’s fourth quarter earnings call in February. The tight situation is not going to loosen up in the first half of 2018, said Lu. Although visibility is not clear for the second half, Diodes is working to add some needed capacity to support growth this year, he said. Lu expects installation of the equipment from KFAB in SFAB 1 to be completed by the end of February. Production capacity is expected to reach 3,000 wafers per month by the end of the first quarter 2018 and 8,000 to 10,000 wafers per month by the end of this year. 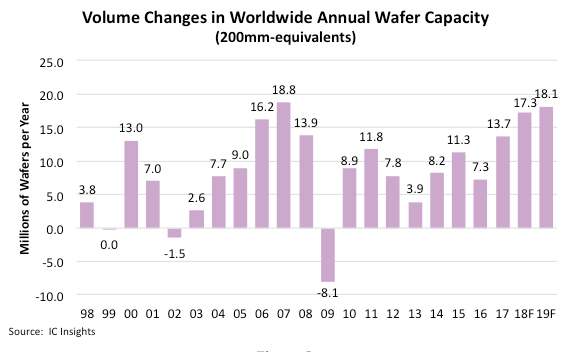 On top of the industry shortages, wafer prices started to increase in the second half of 2017, which impacted profit margins for some of these power and discrete semiconductor makers and led to component price hikes. “The worst case impact on gross margin is estimated to be about 2 percent to 3 percent for calendar 2018,” if the increase in wafer prices are “left unmitigated,” said Young-Joon Kim, CEO, MagnaChip Semiconductor Corp., during the company’s fourth quarter 2017 earnings conference call in February. To offset the rise in wafer prices, MagnaChip has raised prices on some of its power discrete semiconductor devices, and is evaluating pricing options with its foundry customers. Some of those steps to offset the higher wafer costs include making prepayments to its suppliers “to secure adequate supply and/or favorable pricing to support our business,” said Jonathan Kim, EVP & CFO, MagnaChip during the conference call. MagnaChip also signed a longer term wafer supply agreement, and will “continue to be opportunistic about acquiring raw wafers at attractive prices, including using multi-period purchase supply agreements as is appropriate for our business,” Kim added. The company also has increased its buffer stock of raw wafers in inventory, “which was a deliberate move to ensure adequate supply at attractive prices,” and is looking at “other cost savings and efficiency methods in the supply chain and in the fab floor,” Kim said. Vishay also had to implement some price hikes. “In some cases, we’ve been able to increase prices because of rising raw materials costs,” said Valletta. 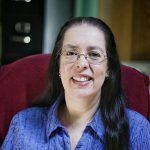 “We’ve been forced to pass those increases on to customers. Vishay, like other suppliers, are experiencing extremely high order volumes and book to bills, which could indicate some double ordering in the industry. “As lead times come down some of those orders will be cancelled,” Valetta said.